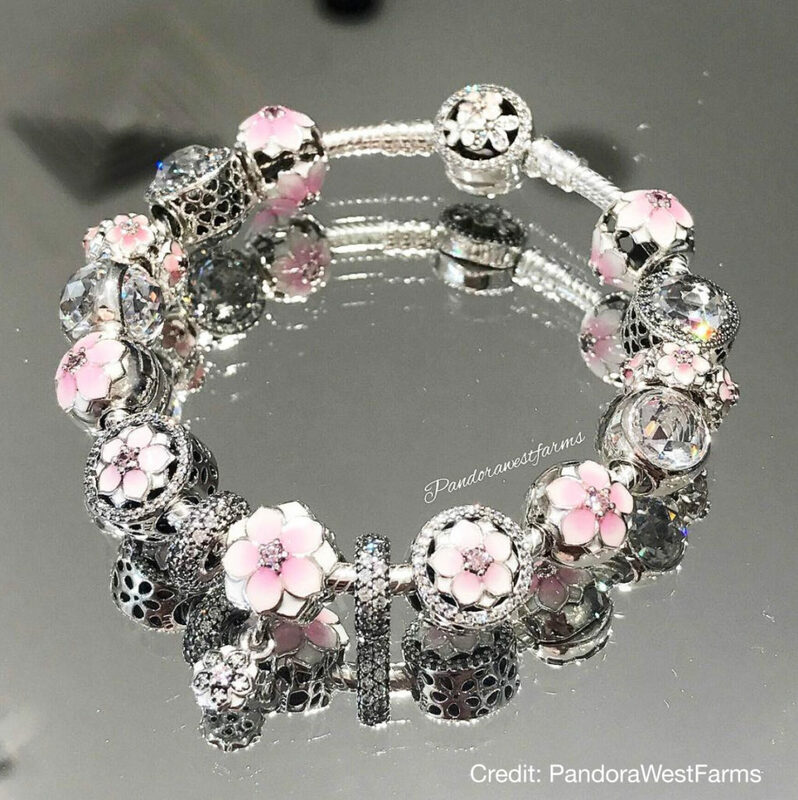 We previewed the PANDORA Spring 2017 Collection a few weeks ago and since then have added prices to the post. 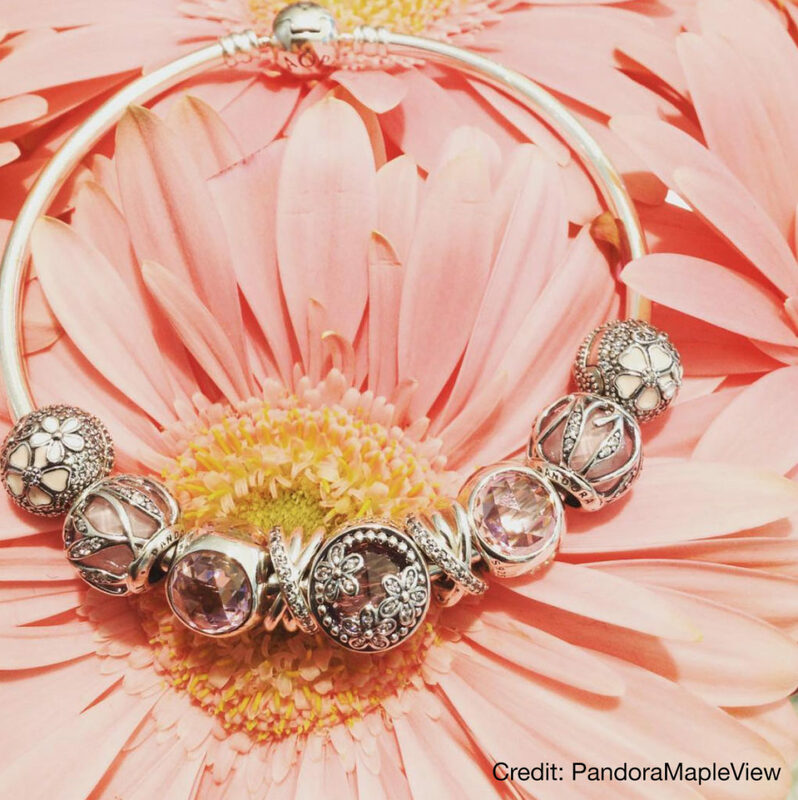 If you are like me though, you love seeing the PANDORA charms in real life. 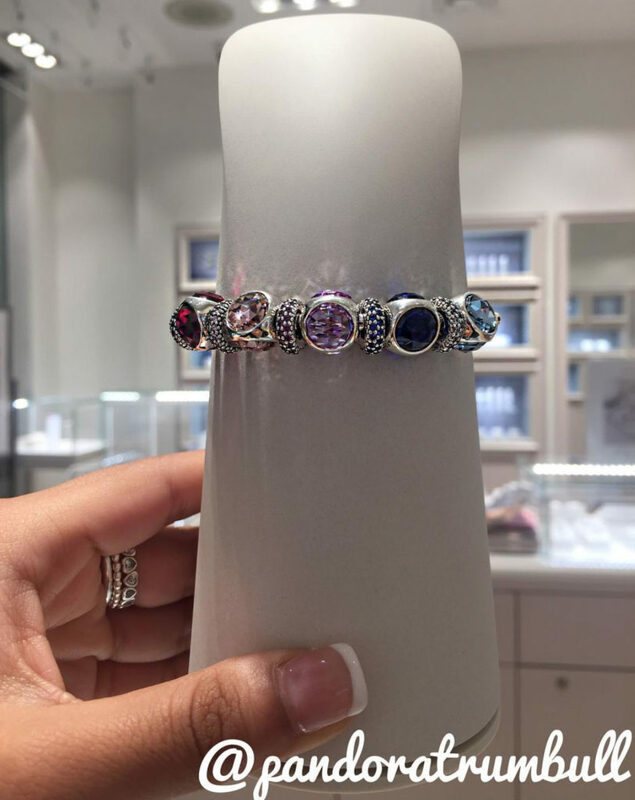 Here are some real life images of the beautiful collection to help you plan you PANDORA purchases. 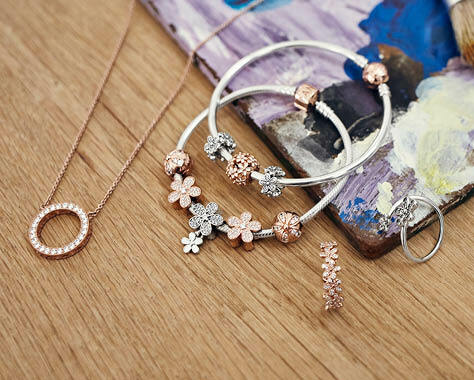 My favourites of the PANDORA Spring 2017 Collection are the Magnolia Bloom pieces. They look even more charming in real life! 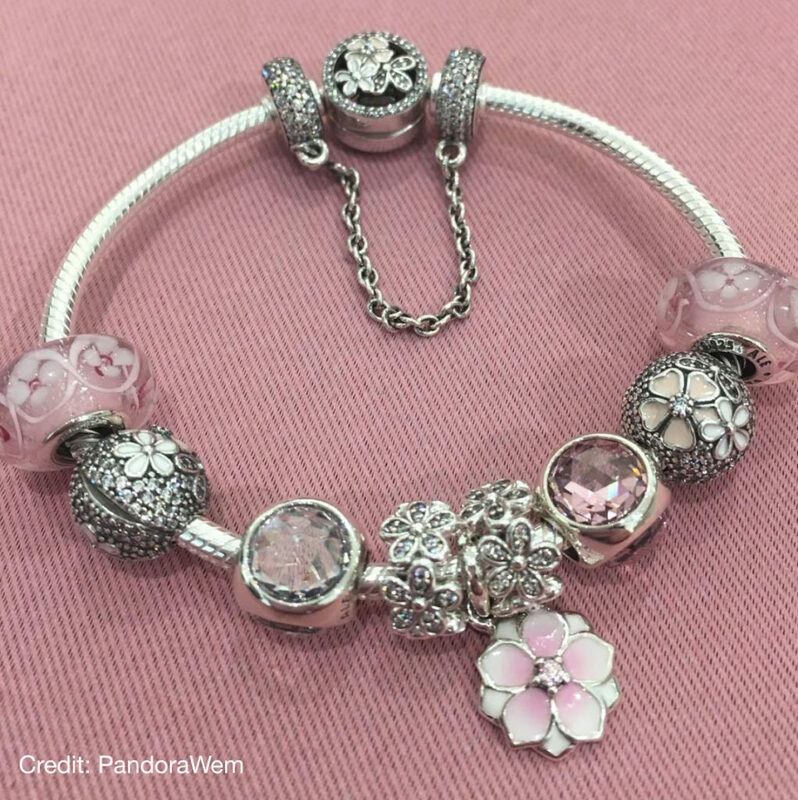 The Happiness charm from the PANDORA Essence Spring 2017 Collection is so pretty. I love the texture and shimmer of the charm. In the stock image it looked a bit peachy but here it appears to be a pretty pale pink colour. 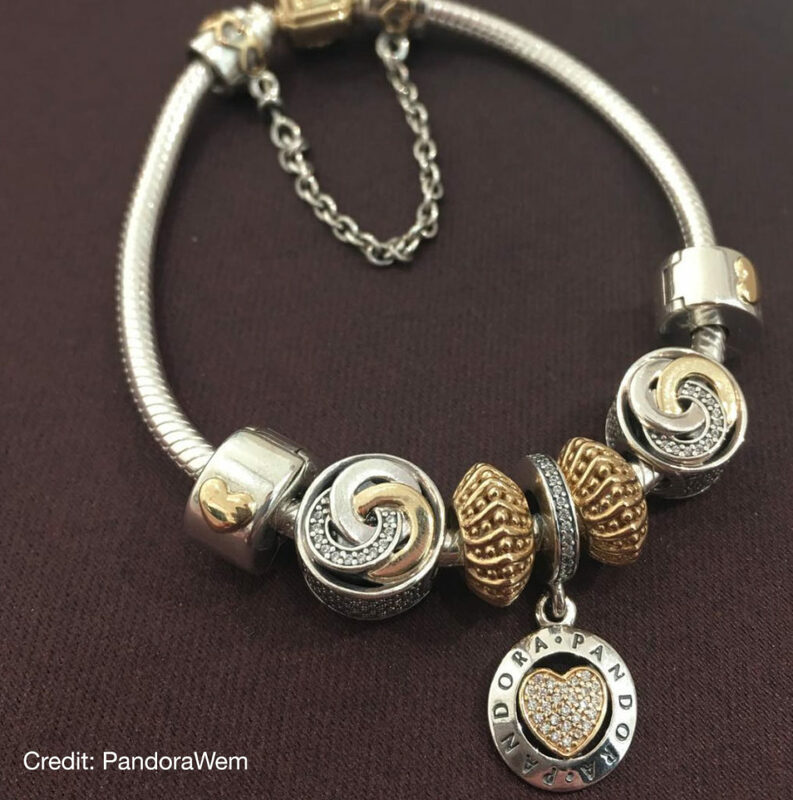 I love the classic PANDORA look of the two tone Classic Heart clips. The Opulent Floral charm (centre) is also stunning, but I imagine out of my price range. 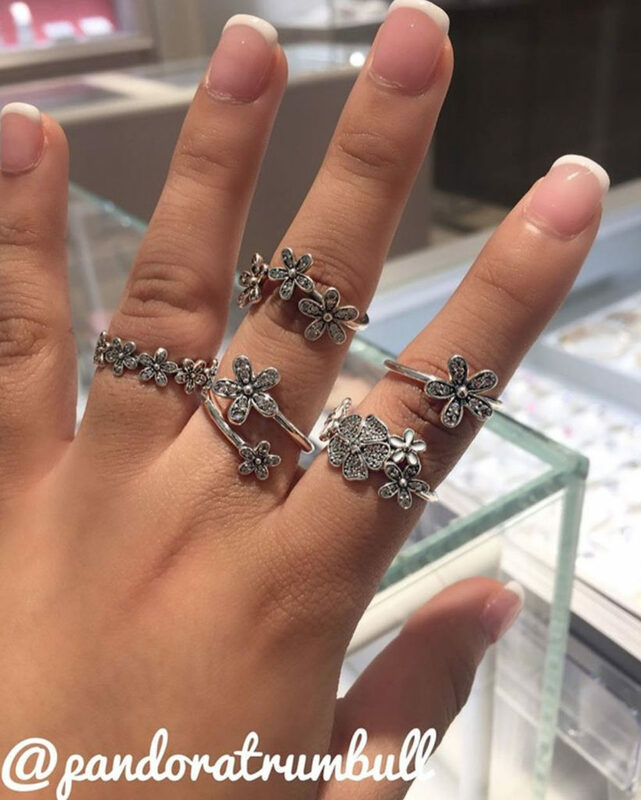 The Dazzling Daisy ring looks fantastic paired with the previous Daisy and Poetic Bloom Rings! I love this floral frenzy! Perfect for the 70’s revival this year. The Radiant Droplets fit their name don’t they? I think they look great worn together. My favourite colours are the Icy Green and Aqua Blue. 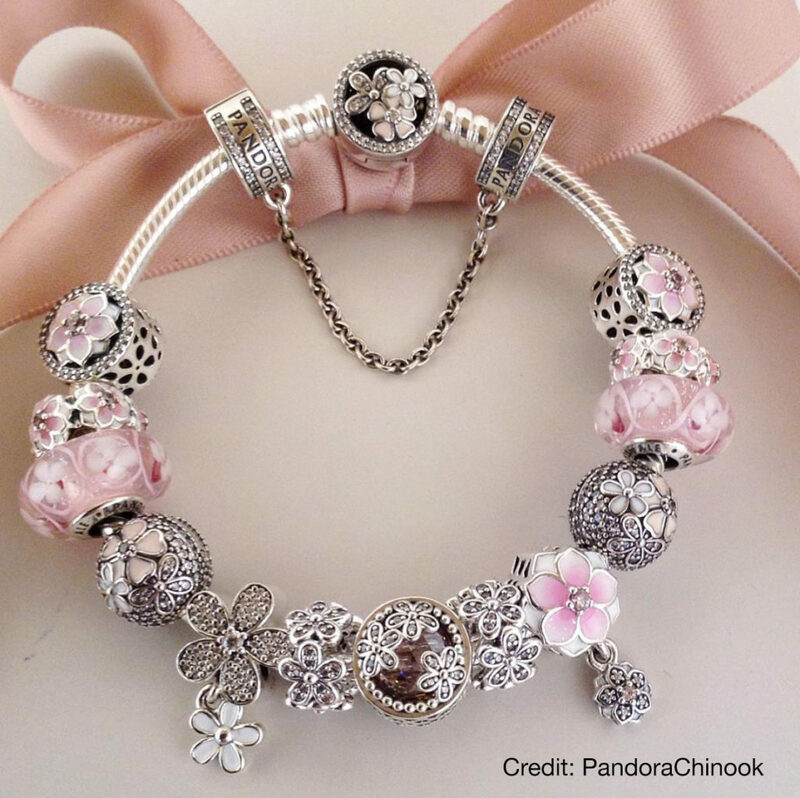 The Field of Flowers murano charms are on most PANDORA fans wishlist, including mine! 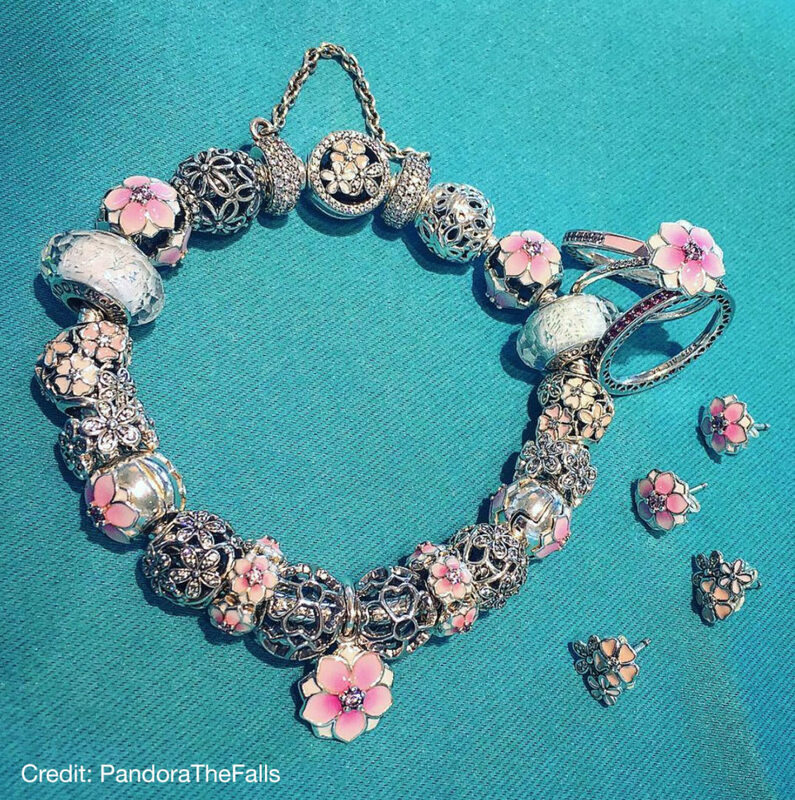 They look great here paired with the Dazzling Daisy Meadow charm and the Poetic Blooms Clips. I wasn’t sure about the Dazzling Daisy Meadow previously but it looks very pretty in real life. 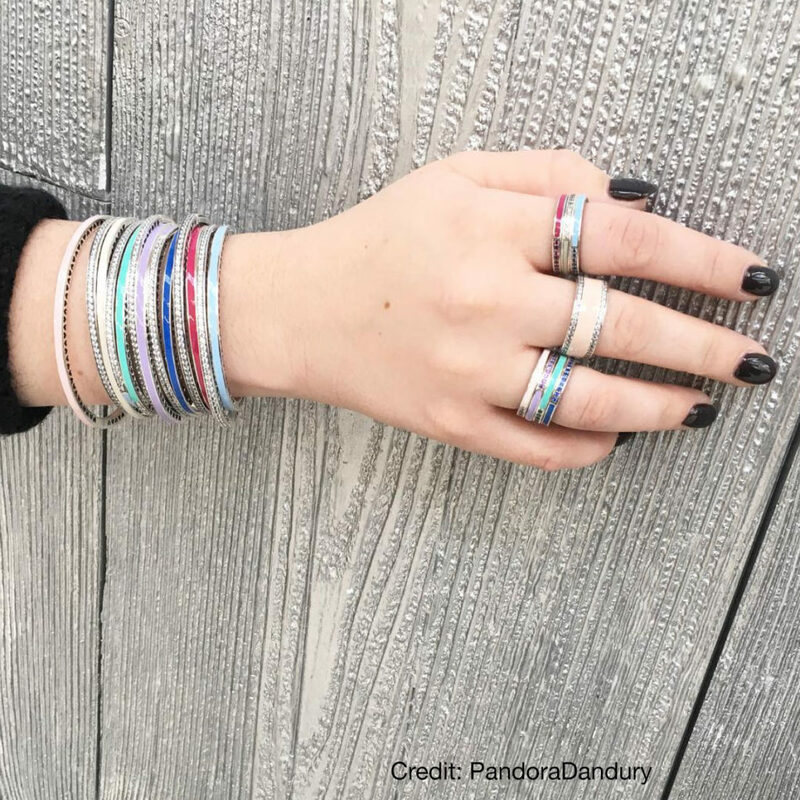 The Radiant Hearts Bangles look fantastic work together! This look is bang on trend for the Pop Art fashion this year. 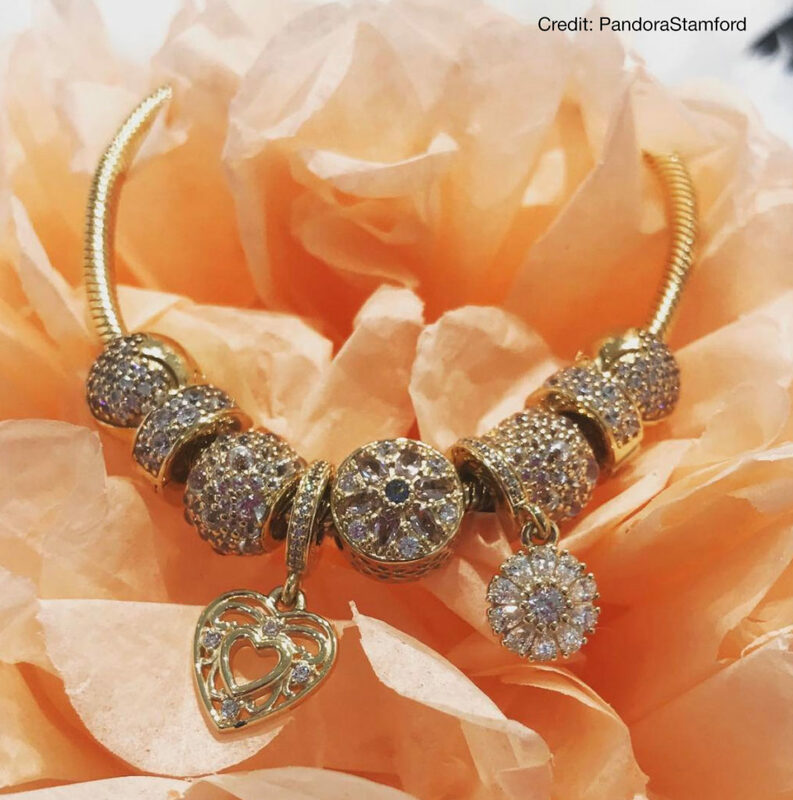 PANDORA Rose looks wonderful paired with the Pink Radiant Hearts Band. 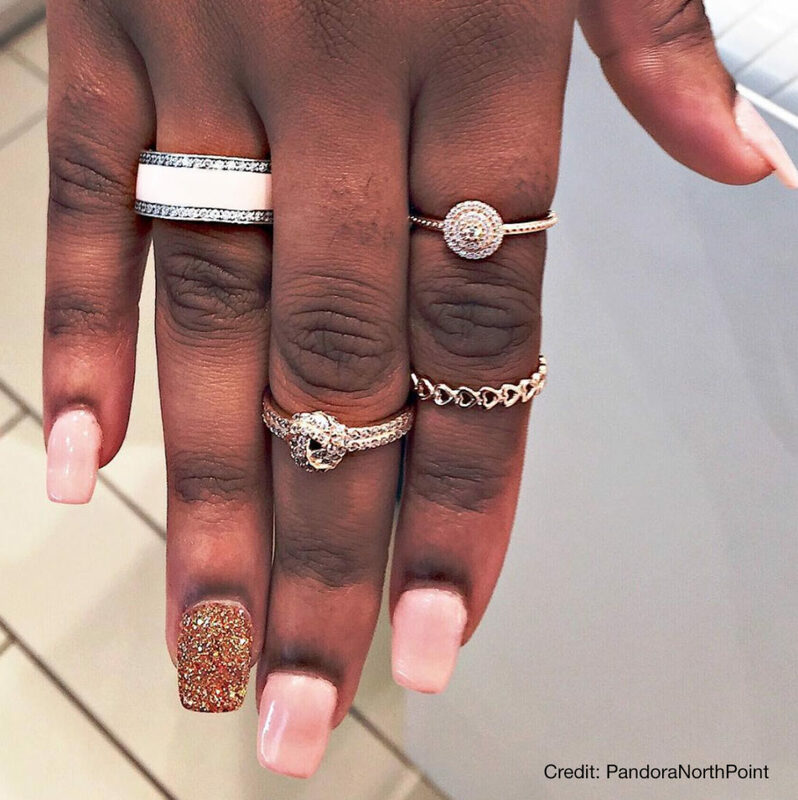 I love this ring combination! 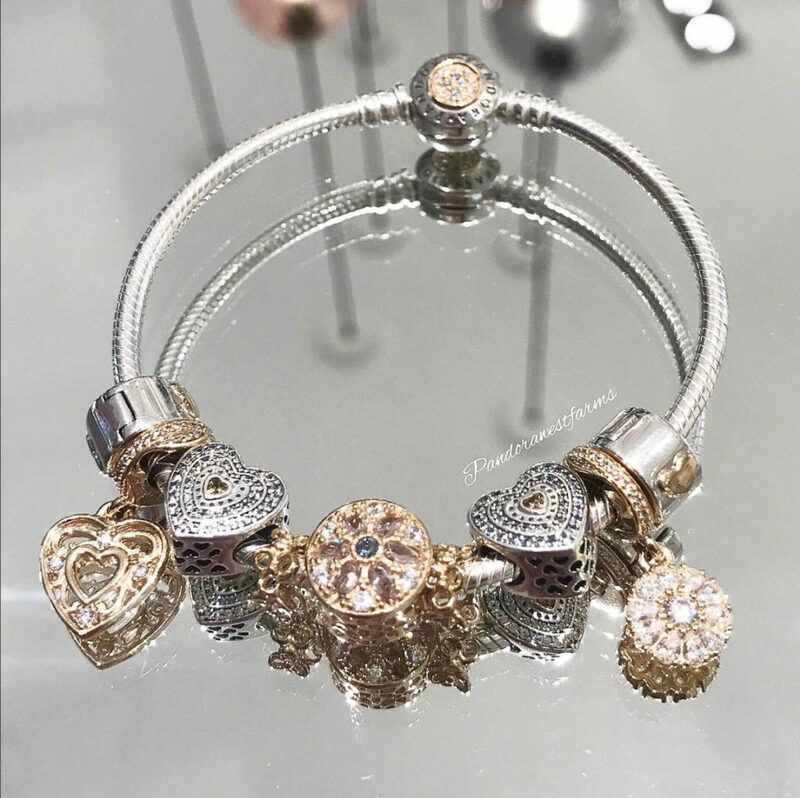 Here we can see the new Fairytale Crown, Birthday Cake, Intwined Circles, Celebration Heart, Lavish Heart and Glittering Hearts of PANDORA charms. As well as the new PANDORA Heart Dangle and Insignia Clips and Safety Chain. 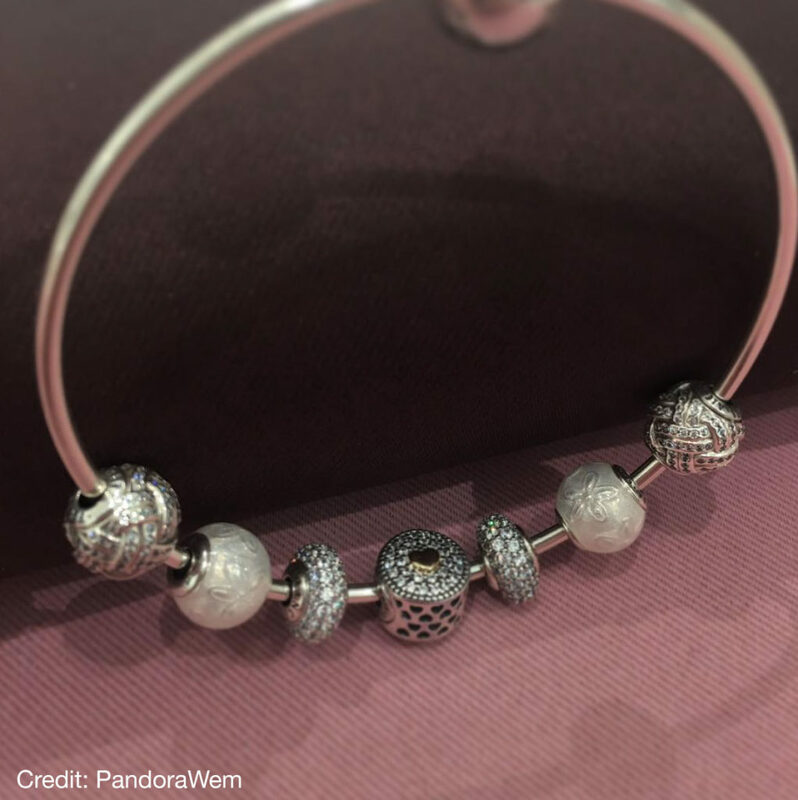 Look at how sparkly the Glittering Hearts of PANDORA charm is! 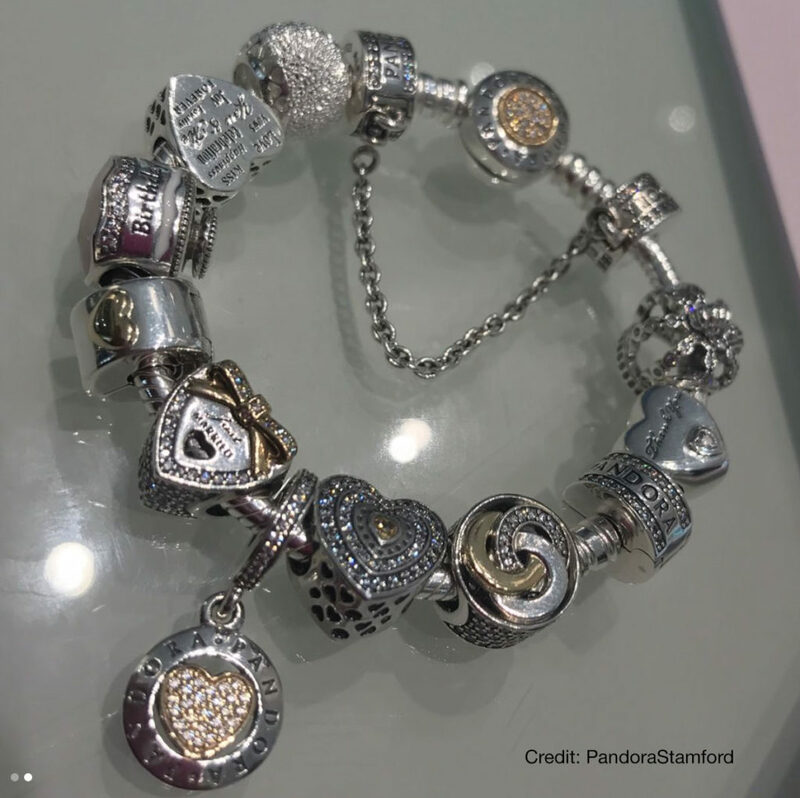 Finally we have a live shot of the PANDORA 2017 Club Charm. 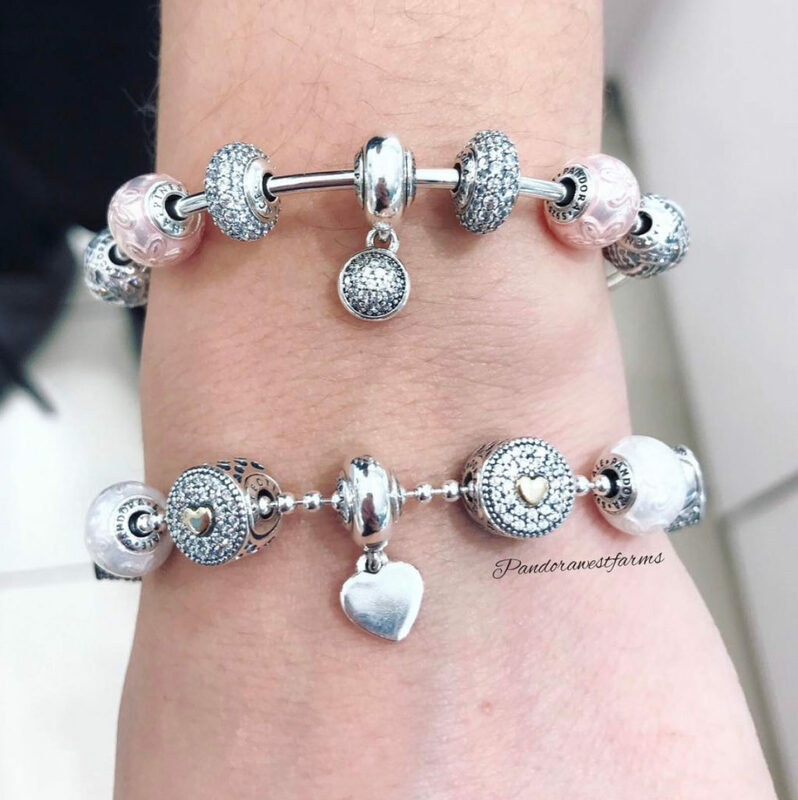 I haven’t got any of the PANDORA Club Charms as yet, although the PANDORA 2016 Club Charm is still on my wishlist as I never got round to purchasing it. I love the 2017 design and plan to get it. I think the pendant style will work great on a bracelet or necklace. It would look fantastic worn on a necklace, stacked with the new Heart Locket too! 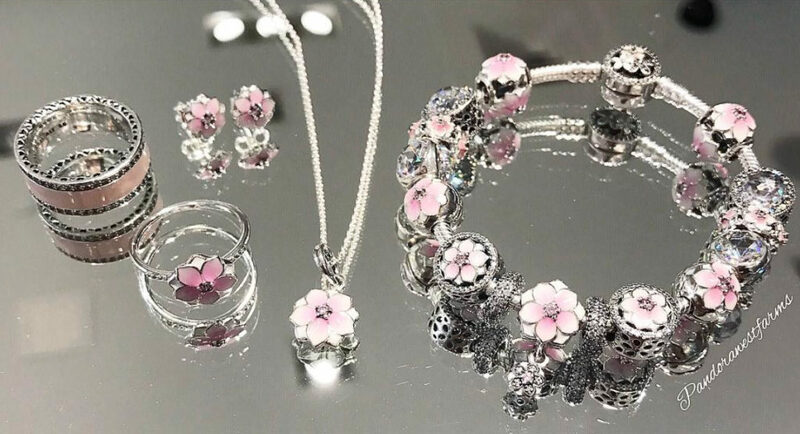 The PANDORA Spring 2017 Collection will be released worldwide on 16th March 2017 and will be available from our preferred PANDORA retailer BeCharming.com. 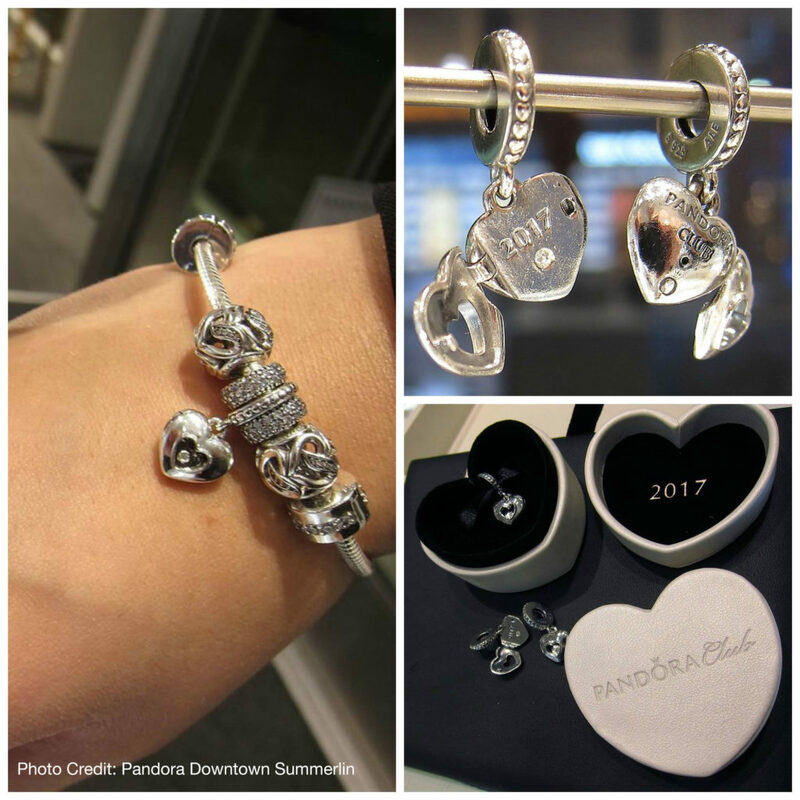 What do you think of the PANDORA Spring 2017 Collection? Is there anything you will be adding to your wishlist? Let us know in the comments below. The Spring collection looks so lovely. Always my favourite collection. Can’t wait till it released here in the UK. Yes I love the Spring collections too! I love floral and nature charms. I would love to see some more animal charms in the future. I wasn’t very keen on the previous ones released in the ‘cake-pop’ style. Only a few more days to go! Thanks for commenting. I hope you are enjoying the site ? Thanks, Dora, for these lovely pictures of the spring collection! 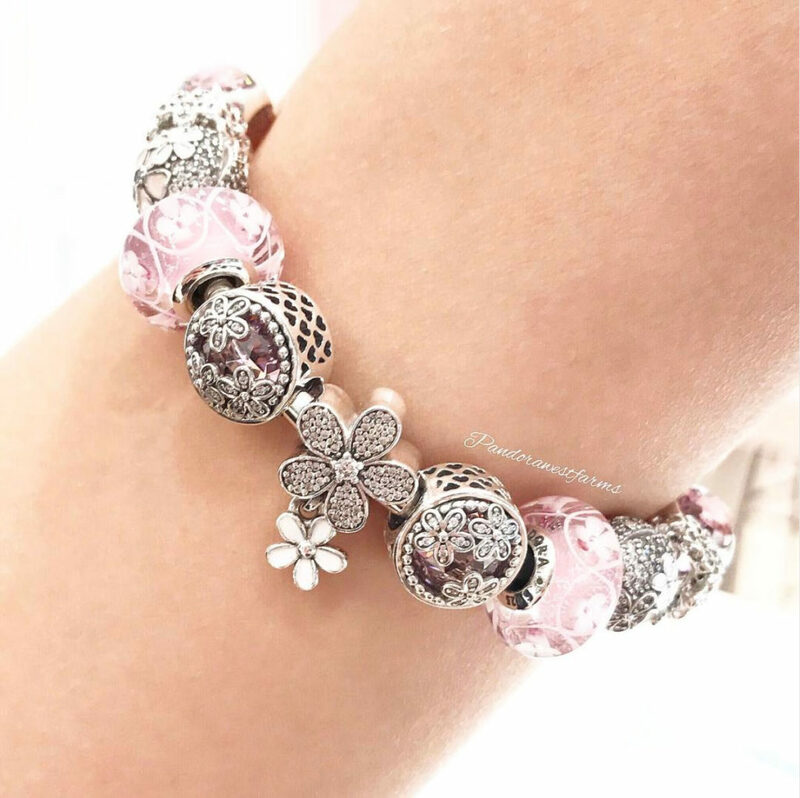 The new Poetic Blooms bracelet shown with the magnolias, daisies and pink Field of Flowers is stunning displayed on a mirrored background. I can’t wait to see everything in person. It’s nice to see the collection in ‘live shots’. Often the live shots are what make me fall in love with certain charms. 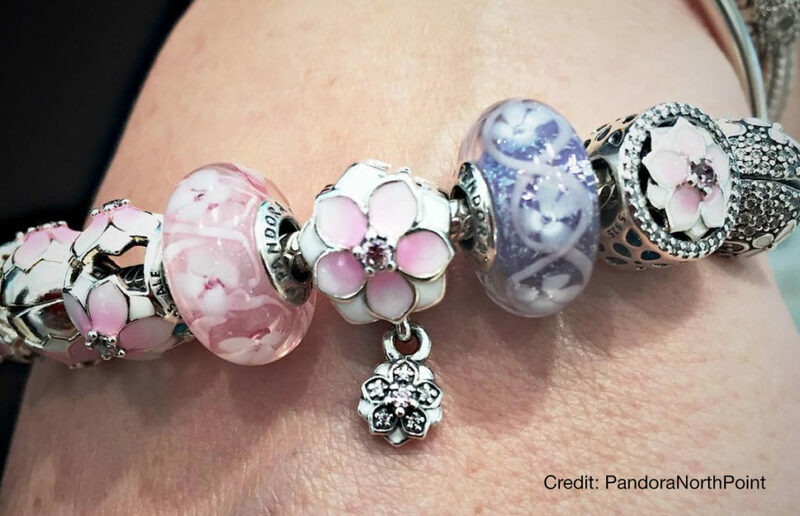 The detail on the Field of Flowers Murano charms is incredible! It looks like we have the same favourites ? I hope you are able to pick out your pieces soon.